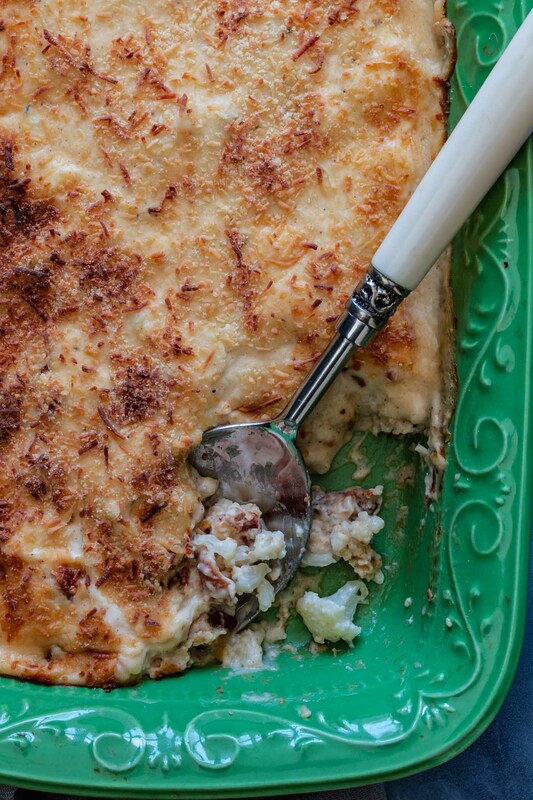 Far from boring, this Cauliflower Gratin is rich, creamy and loaded with bacon! A simple side dish that is guaranteed to impress. To be 100% honest, I used to loathe cauliflower! I never understood people who said they loved the boring, tasteless veggie, until I had an epiphany! Cauliflower is only tedious if you make it bland. And then, out of the blue, cauliflower became a trend. Everybody was using it to substitute pizza crust, pasta, rice and even steaks! “Is everyone freakin’ mad? What is going on?” Begrudgingly, I decided that it was time to try it again. Maybe the problem was me… Certainly the only explanation was that there was a secret to cooking cauliflower that nobody was telling me. So I decided to investigate, by trying a bunch of cauliflower recipes until I’d find something that would make me lick my plate clean and say “YUM”! Gladly, it didn’t take long. 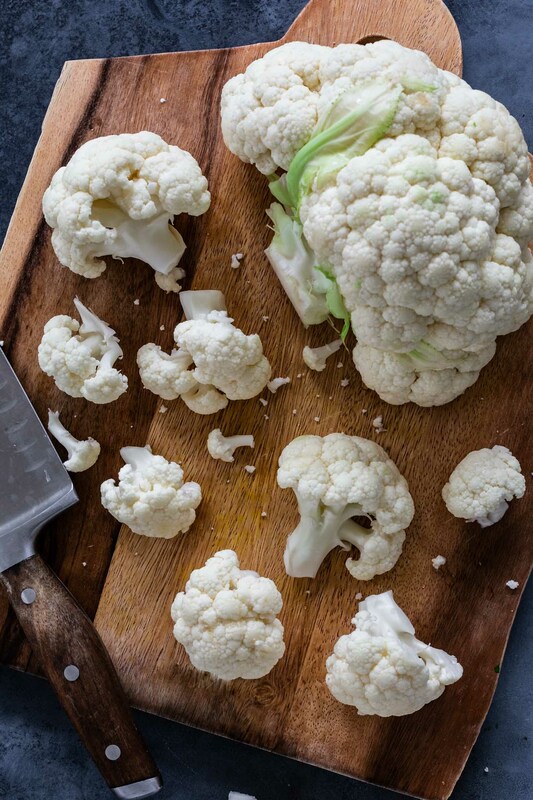 It turns out that cauliflower can be unrecognizably delicious! Since it is a mild vegetable, it will take on the flavor of whatever you cook it with. So if you add cream, garlic, cheese and bacon, it will be anything but boring! If you’re a cauli-hater and is feeling a bit skeptical right now, don’t! I dare you to give this gratin a try! It will change your life! It took me at least three attempts at this gratin recipe before I was satisfied enough to call it “blogable”. Everybody knows that a good gratin starts with béchamel sauce, but I was stubborn. I didn’t want for you to have to use the stove! So I tried a bunch of ways: with half and half, with heavy cream, with heavy cream + cream cheese. They all ended up delicious but swimming in a pool of liquid and fat. There was no way around it. The creamiest, richest and most satisfying cauliflower gratin was the one that started with béchamel. To that, I added garlic, cream cheese, some heavy cream, parmesan and a little bit of paprika. Poured all that goodness over the steamed cauliflower florets and bacon, and covered with more parmesan and some breadcrumbs. The top is cheesy and crispy, hiding a luscious layer of well seasoned cream, cauliflower and bacon. It’s the epitome of comfort food! Can this casserole be made ahead? The best thing about casserole dishes is that you get to make them ahead! This is especially handy if you are making it as a side to a big feast, like Thanksgiving or Christmas. You can make it 1-2 days ahead. Just prep and assemble as it’s written in the recipe but save the top layer of parmesan and breadcrumbs for when you are ready to bake! I would remove it from the fridge and allow it to come to room temperature for about 30 minutes before baking. If not, you risk the top getting golden brown while it’s still cold in the middle. Can I freeze cauliflower gratin? I know I’ve said that before, but I’m not a fan of freezing dishes with dairy in it. I find that the cream separates and the texture gets altered, ending up grainy and unpleasant on the palate. That being said, some people don’t mind the change in texture after freezing and reheating cream dishes. If you’re one of them, go for it! I would just make sure to reheat slowly to minimize the splitting. This dish is a great side at your holiday table and easy enough for everyday meals. It pairs beautifully with meat and chicken but it’s filling enough to be the main dish! In fact, I serve it as the main entrée fairly often, accompanied by rice. I’m a huge rice eater and love how it soaks the cheesy cream! This gratin is also easily made vegetarian, by omitting the bacon. So, what do you say? All aboard the hype cauliflower train? If you’re not already on it, I highly suggest you jump in. After all, long gone are the days of unappetizing boiled cauliflower! It’s time to enjoy this vegetable for what it really is: a versatile ingredient that tastes amazing when smothered in cheese and cream. Cook the cauliflower. Bring a pot of salted water to a boil. Once boiling, place a steamer basket or insert and add the cauliflower florets. Cover and steam until the cauliflower is tender, about 3-5 minutes. (Do not overcook or it will get mushed after baking in the casserole!) Rinse under cold water to stop cooking. Reserve. Prepare the sauce. In a large saucepan, over medium heat, cook the butter until it melts. Add the garlic and sauté quickly, so it gets fragrant, without letting it brown. Add the flour and whisk, making a roux. Cook for about a minute, letting the roux thicken and darken a bit in color. Carefully and slowly pour the warm milk, whisking constantly until it thickens and starts to bubble. Lower the heat and season with salt, pepper, nutmeg and paprika. Then, add the cream cheese and cook, stirring, until the cream cheese melts and incorporates. Remove from heat and add the heavy cream and 1 cup parmesan, stirring with a spoon until smooth. Assemble the gratin. Add about a 1/4 of the sauce to the bottom of a 8 x 11 inch baking dish. Follow with the steamed cauliflower and crumbled bacon. Top with the cheesy béchamel sauce and finish by sprinkling the remaining parmesan cheese and breadcrumbs. Bake for 25-30 minutes, until golden brown and bubbly. If desired, you can finish it under the broiler to really crisp it up.